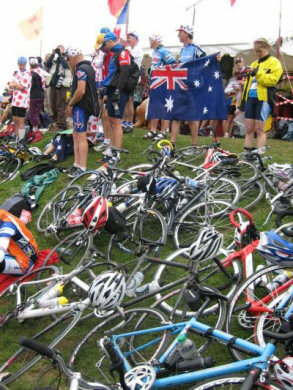 Climbing alpe d’huez in 35degree heat with 50,000 people lining the sides of the road on the 13.8 k climb to the top zigzagging all the way up being encouraged, having water tossed over me, hearing people say "allez aussie" are memories that will never leave me. I did the climb the first time in 1hr 45mins and a bunch of us (6) after getting pissed at dinner decided to ride down and back up the following morning. We took off at 6.15 am and flew down the mountain in the cold morning air past campers and campervans all the way down the mountain past people still asleep in their sleeping bags. I got down in 16mins turned around and went back up in 89 mins and was the last of the six to walk in while the rest were having breakfast. Special yes you could say that.